The auction system was very popular across Britain during the 19th century. The Industrial Revolution had brought about a great increase in wealth for many people and it created a new middle class. These newly affluent members of society spent their money on houses and furnishings to demonstrate their new status. Auctioneers like Geo. G. Vieweg, were aptly placed to take advantage of this desire to create a new and comfortable lifestyle. 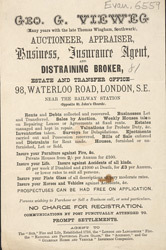 As can be seen from this leaflet Vieweg not only offered his services as an Auctioneer but also as an Insurer and Broker.